Rose, walked Mix and breakfasted in the farmhouse. Tom and I intended to start on the roofing felt but then we remembered that the nails for the felt were still in the back of the car which Tom had been driving yesterday so we went along to Tom’s home, changed cars and returned to Mount Pleasant. 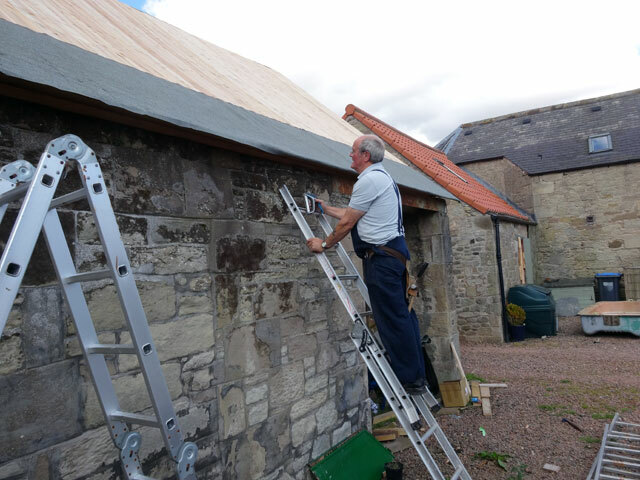 Now we discovered that David needed to go to Berwick to exchange the excess roll of cable for the electrical components which were required for completing the Stables. I asked if I would require my credit card, but it seemed not. So we set off. Once we arrived at Berwick the electrical factors were delighted to exchange the excess cable roll for all of the components we required. However, as the boss was not there, we required my credit card. So back we came to Mount Pleasant and then back we went to Berwick. By lunch time we had all of the electrical bits and pieces on site but we still had put no roofing felt on the Bothy roof. Tom went off for lunch. I had a coffee with David and soon it was time to start work again. More frustration. We cut the first length of roofing felt the size of one length of the roof. We actually (although it was extremely heavy) got a full length onto the roof but as we put in nails it just pulled away under its own weight. Eventually we had to put the felt up in sections – but discovering this had taken so long that we only got the one length up today. Still now we know what we are doing. I spent the last couple of hours of the afternoon sitting in a deck chair and listening to the final session of the Test Match between England and India from Manchester. England are doing well and India were removed for just 152 (having won the toss and elected to bat). England had reached over a hundred for the loss of three wickets by the close. We all dined in the farmhouse (Olive’s friends are still with us and had spent the afternoon in the grounds of Duns Castle). After the meal – it was a happy occasion – Rachel and I watched an old Foyle’s War which we had missed the first-time around; it was based on VE Day and was quite interesting as well as being a good story. Having caught up with the News I came out to the summer house to do my diary, only to discover that my computer had crashed and wouldn’t restart. In fact it took the length of a Carry On film (watched on my i-pad) to get the computer up and running and by that time I was so dead-beat that I quickly walked the dog and went to bed.